For the most part pinups did not play an imported role in the Simon and Kirby repertoire. 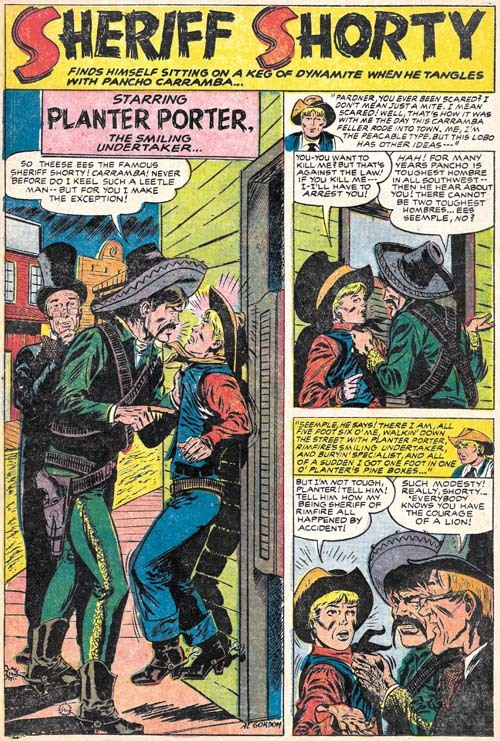 The most import exception was Boys’ Ranch where double page and inside cover pinups were present in each issue. Other than those from Boys’ Ranch there were only two other pinups that I can think of. 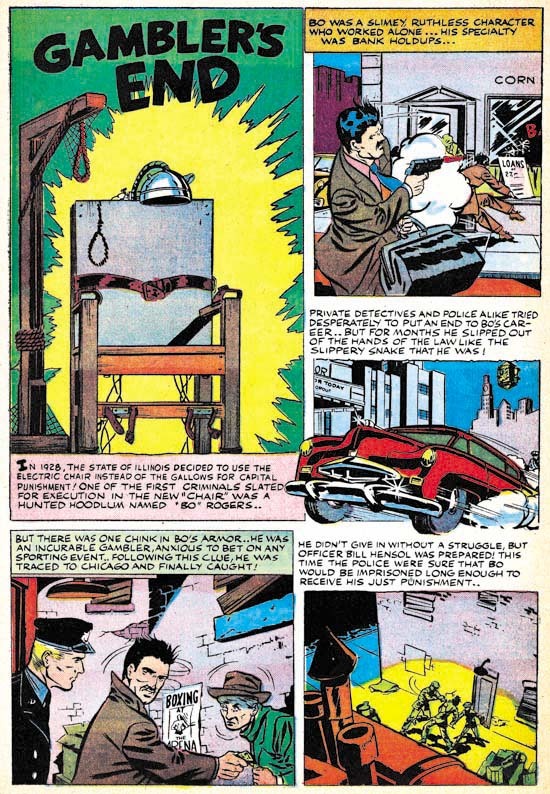 One appeared in Win A Prize #1 (February 1955). I have discussed that one previously (The Wide Angle Scream, Almost an Afterthought). While I would not dismiss out of hand Joe’s explanation that the piece was originally meant for Captain America #11, there are a number of details that suggest a later date. Therefore the genesis behind that piece of art remains an unresolved issue. 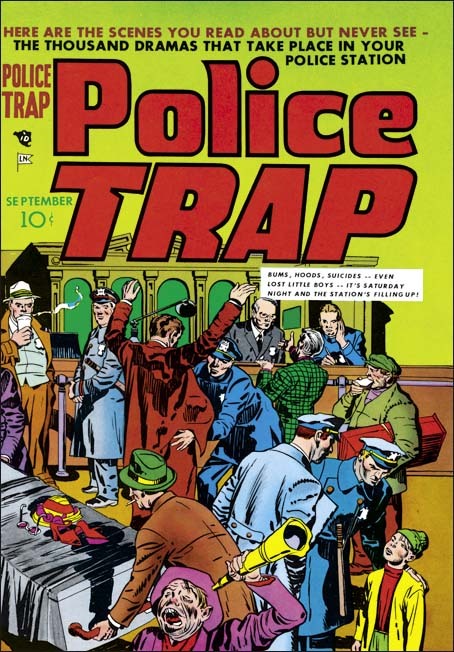 The other Simon and Kirby pinup appeared in Police Trap #2 (November 1954). It is a great pinup with a marvelous cast of characters. Each person depicted in the foreground was given a distinct personality. 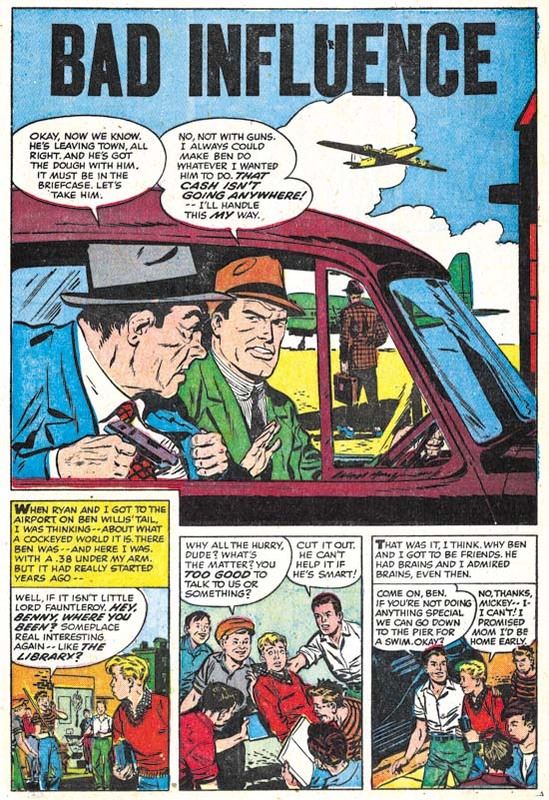 A complete story is presented in this single panel with the added touch of Simon and Kirby humor. Kirby not only drew the art but did the inking as well. I believe it is one of the relatively few pieces that Jack also did the outline inking, a job normally assigned to others. 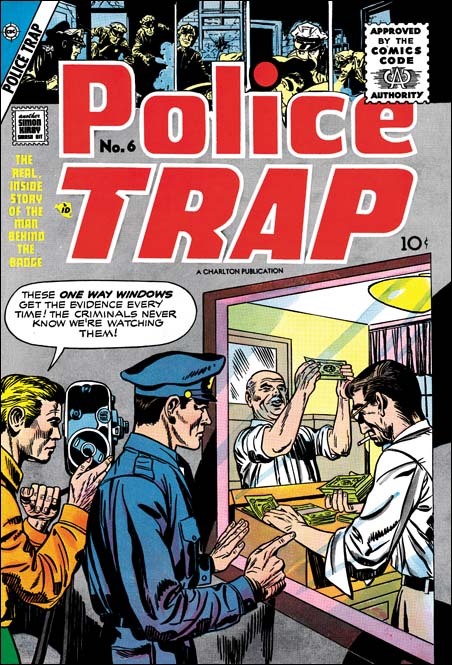 The top caption declares this is the first of series of Police Trap pinups of various police officers. However no further pinups were ever placed in the subsequent issues. Nor were pinups found in any other Mainline titles (Win A Prize was published by Charlton). The natural question is why this one? 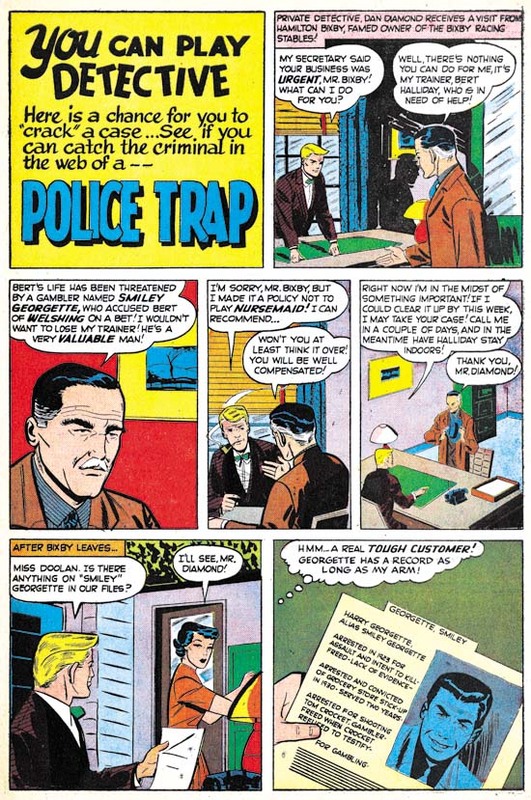 The explanation can be found in the first issue of Police Trap. That issue contains the story “The Beefer” with art by Jo Albistur. Albistur was from Argentina and seems only to have worked in the United States for brief period. 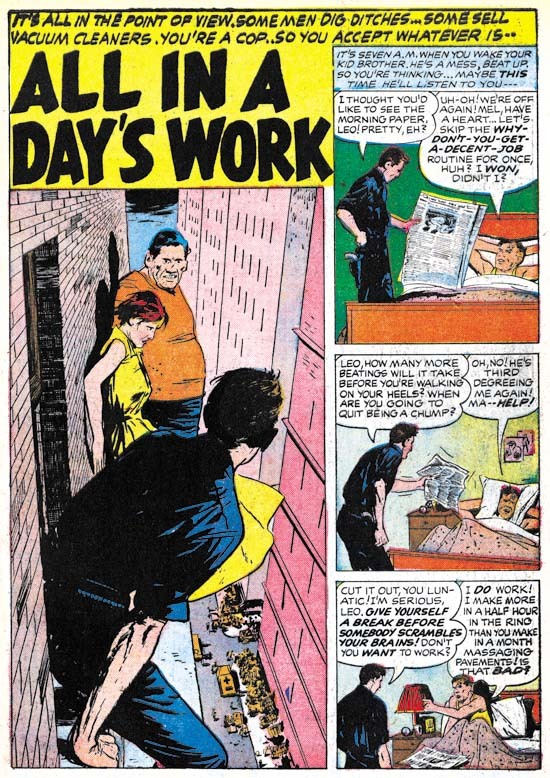 His time working for Simon and Kirby lasted a little over a year but it was very productive period for him. Frankly I am unimpressed by some of the art I have seen that he did for other comic book publishers but he is one of may favorite Simon and Kirby artists. “The Beefer” opens with constant complaining of an arrested street peddler. 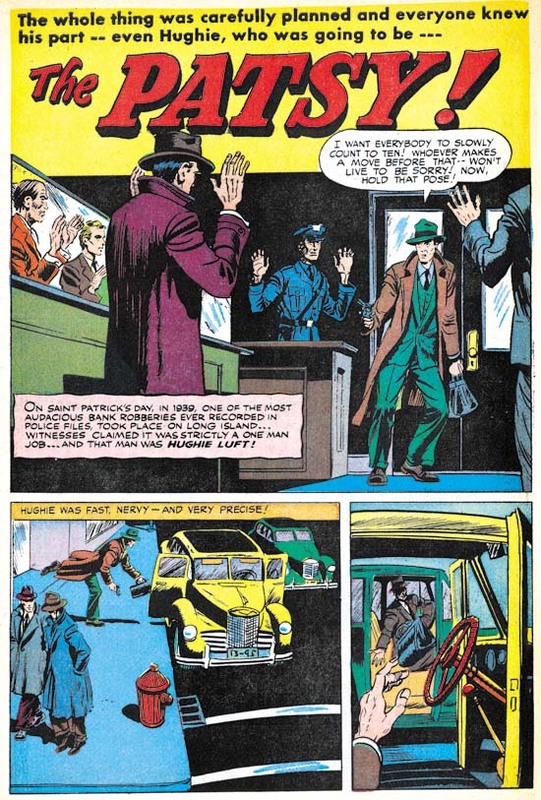 Kirby would often create a cover based on a story from the same issue but illustrated by another artist. 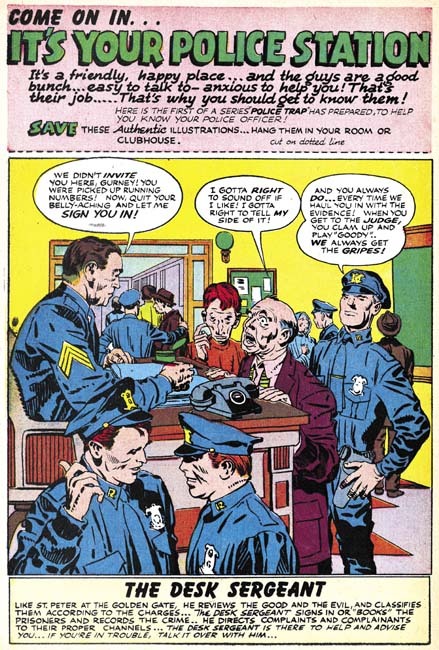 The similarity between “It’s Your Police Station” and “The Beefer” indicates that is what happened here and this pinup was originally intended as the cover for Police Trap #1. The original art for this pinup still exists. It is very unusual for work by Simon and Kirby in that art was constructed from three pieces. The top caption, the art, and the bottom caption are on different illustration boards taped together on the back. In the future Joe Simon would frequently construct art from various separate sources but up to this point such techniques were rarely used. The explanation in this case is that since the art was initially meant for a cover the original top probably had the comic book title. Probably as an expediency this was just cut off. Since Joe and Jack often recycled their work this title may have been used for some other cover. 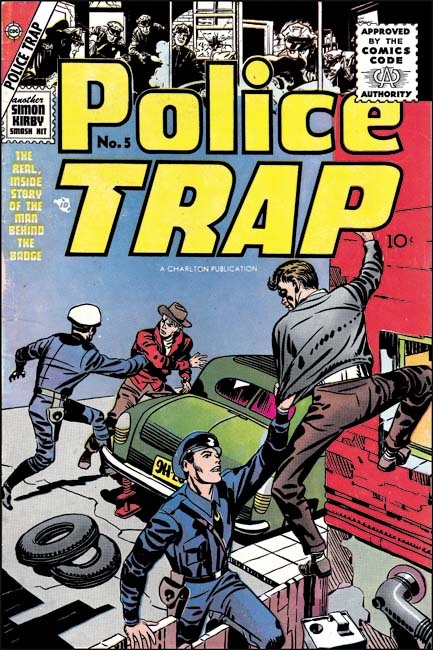 The original art for some of the Police Trap covers still exist and it would be It would be interesting to see if any of them were constructed from two pieces of illustration board. The original bottom of the art was probably not sufficient for the desired caption so it was trimmed as well. 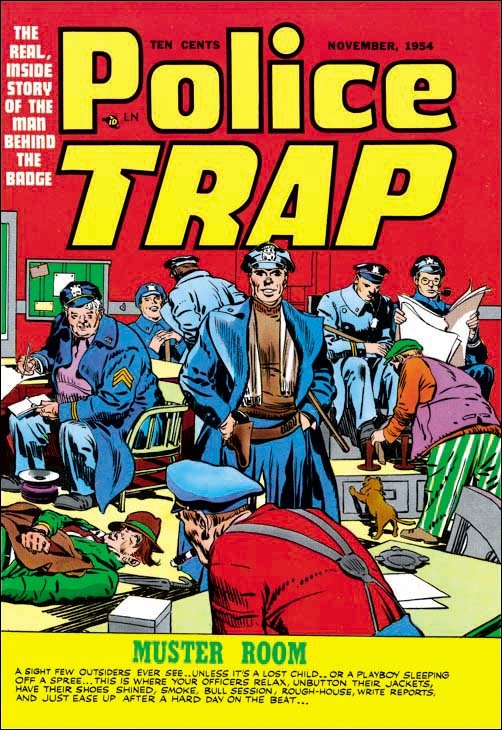 The Police Trap #1 cover that was published in place of “It’s Your Police Station” is certainly a fine piece of Simon and Kirby art. The portrayed scene shows a multitude of characters each carefully handled. The caption actually seems a little superfluous since the art is all that seems to be needed to tells the individual stories. Yes, this is cover art at its very best. That is not to say that the art for “It’s Your Police Station” was any bit inferior. The most distinct disadvantage for the pinup had was that it was very specific to a single story, “The Beefer”. 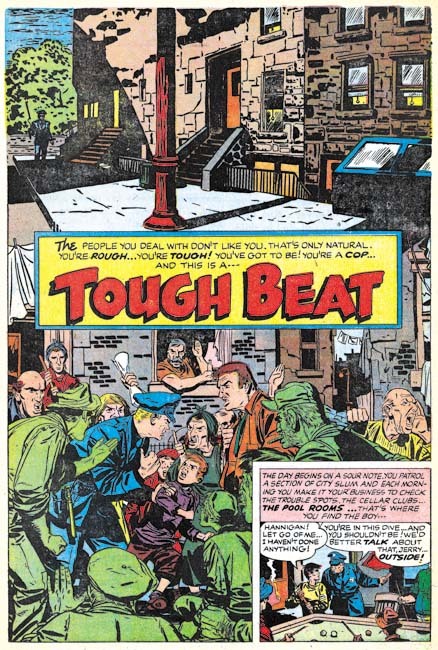 While Simon and Kirby often took that approach to a cover, they undoubtedly considered that the new comic should be launched with a cover that reflected on the theme of the title and not a particular story. 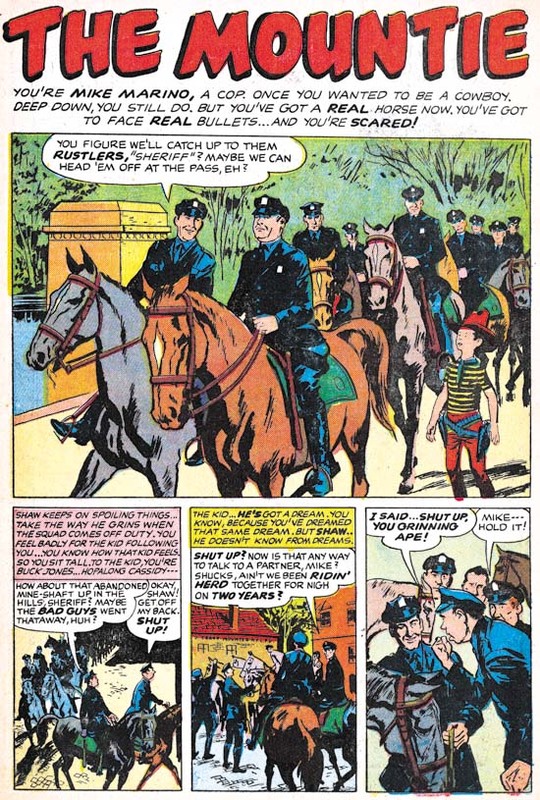 With all the criticism cast at crime comics, Simon and Kirby wanted to emphasize that the police were subject of this new comic not the criminals. This police centric theme is superbly provided by the published cover. 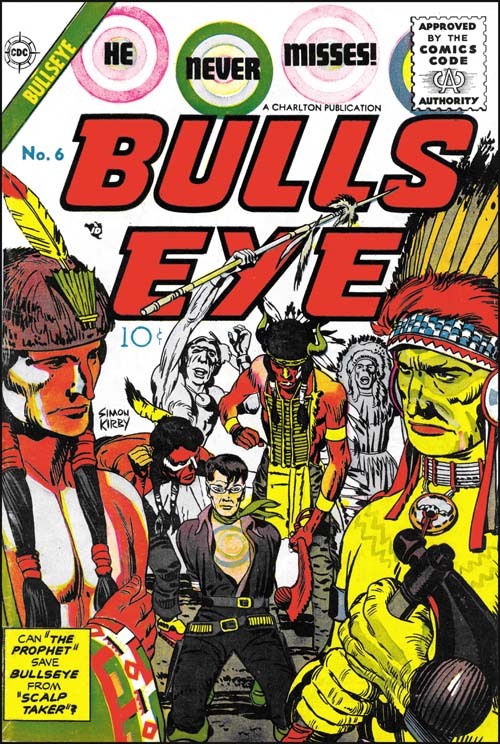 The bulls-eye pattern returns to the cover image for Bullseye #7. The overlapping figures creates an interesting design where the background figures are carefully framed by the foreground ones. 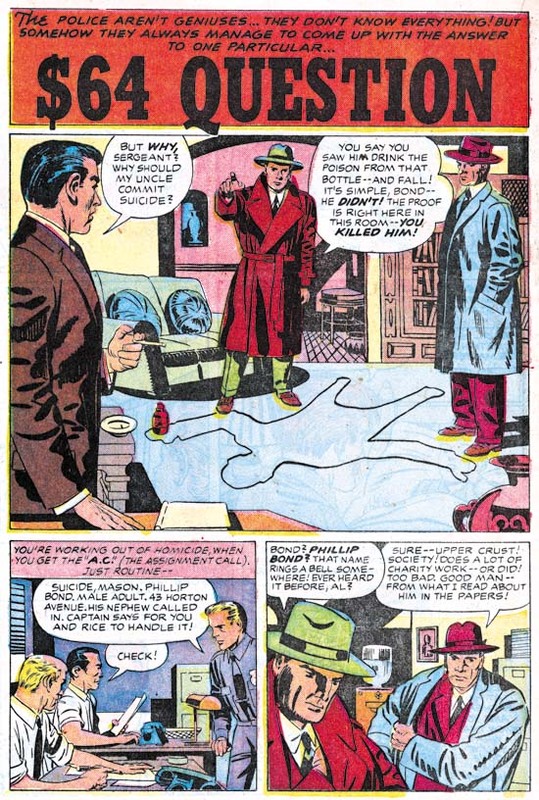 It is always little more than guesswork when trying to credit who did what in the Simon and Kirby collaboration, in this case I suspect that Jack did the layout since this sort of careful arrangement of figures was often found in the work he produced later when working without Joe. While it is an interesting composition, it is not at all clear what is being depicted. All three individuals appear to be aiming their arrows at different targets, so it does not appear to be a shooting contest. Bullseye’s smile would be out of place for a combat usage. In any case why would a cavalry soldier be using a bow and arrow? 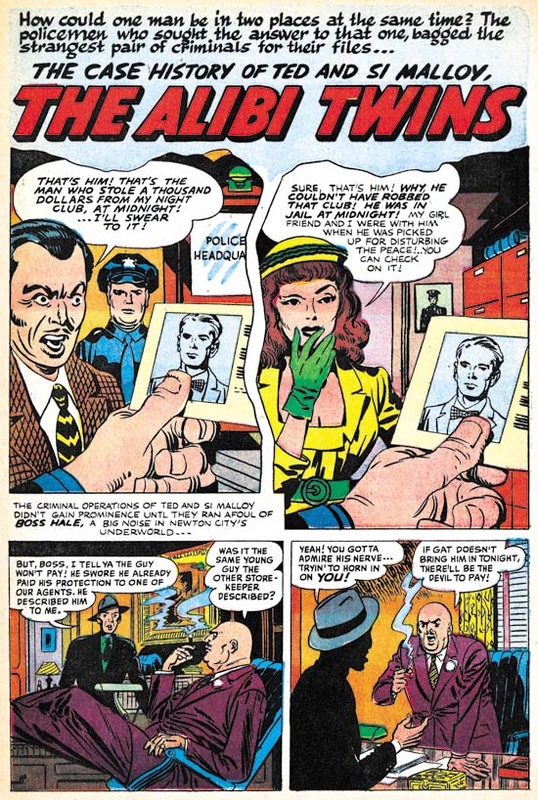 While Simon and Kirby covers generally can be decoded to reveal a story, the cover for Bullseye #7 seems meant to be nothing more than an compelling image. 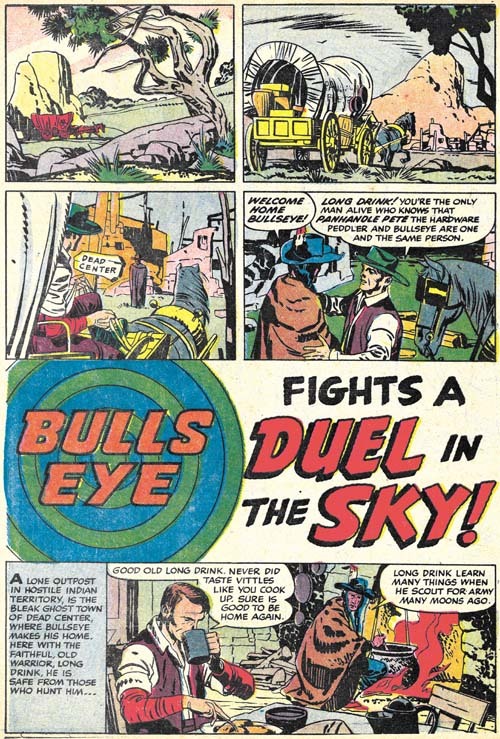 The first story, “Duel in the Sky”, has an unusual opening; no splash panel and the title occurs below two panel tiers and above another story panel. Kirby has used splash-less stories before but this one is special. 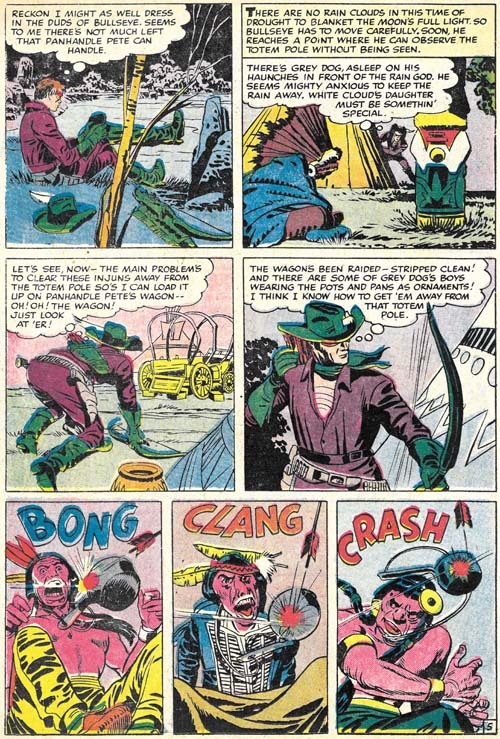 The first three panels have no text and show nothing more than Bullseye’s alter-ego traveling over a western landscape. 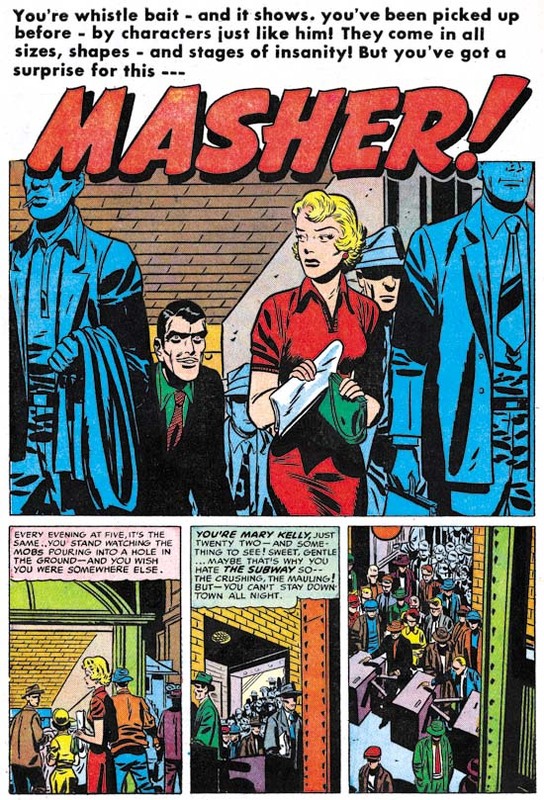 Simon and Kirby usually try to fill their stories with as much as possible so allocating the three panels used in this introduction is quite special. Obviously the introduction was considered worth it but perhaps the splash was sacrificed to make room for it (it is the only Bullseye story without a splash). This introduction shows Bullseye returning to Dead Center, his birthplace, to visit his friend Long Drink. Normally Bullseye traveled about; only in one other story (“The Ghosts of Dead Center”, Bullseye #3) does Bullseye visit Dead Center. 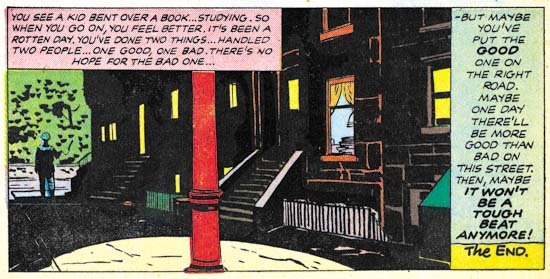 This sort of reference to his past was unusual at that time where continuity was pretty much neglected in comic books. 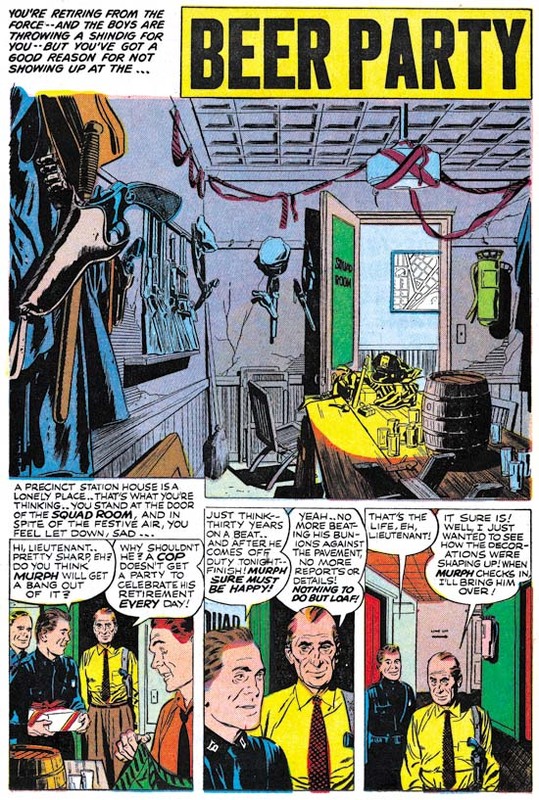 Kirby always had a penchant for technology so I suspect it was his idea to include balloons in this story. The use of such a technology at that period is not unrealistic. During the civil war an attempt was made to use hot air balloons for observation. Unfortunately the balloons became a target and at least one was shot down. In any case the balloons adds interest to another Simon and Kirby masterpiece. It does not hurt either that the story ends with another fantastic Kirby fight. While “Duel in the Sky” has a perfectly acceptable ending, “The Flaming Arrow” picks up from there with Bullseye going off to prevent an errant balloon from falling into the hands of Mexican bandits. It is a short but rather nice piece that ends with Bullseye returning to visit Long Drink once again, the last page being a bookend to the first page of “Duel in the Sky”. In fact the same three panels, with slightly different cropping, that showed Bullseye traveling show up again. 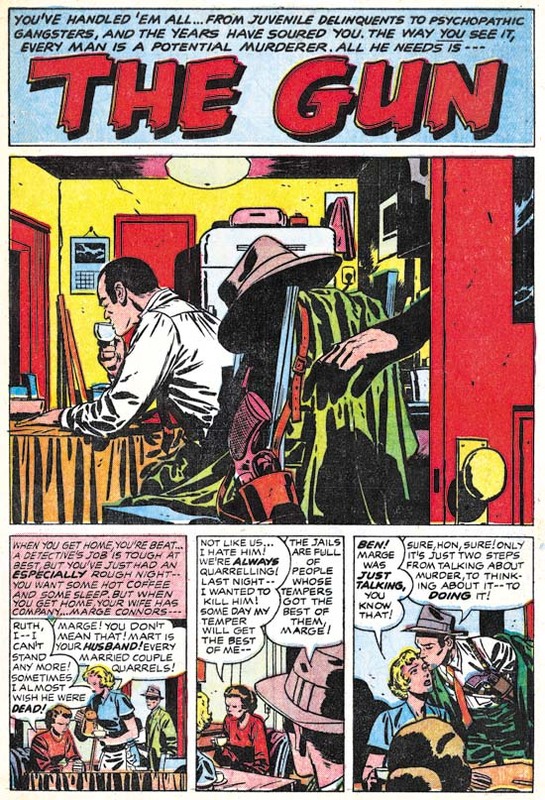 The next and what would turn out to be the final Bullseye story, “The Stolen Rain God” opens with a double page splash. I have discussed this piece of art previously in my yet to be completed serial post (The Wide Angle Scream, Almost an Afterthought). 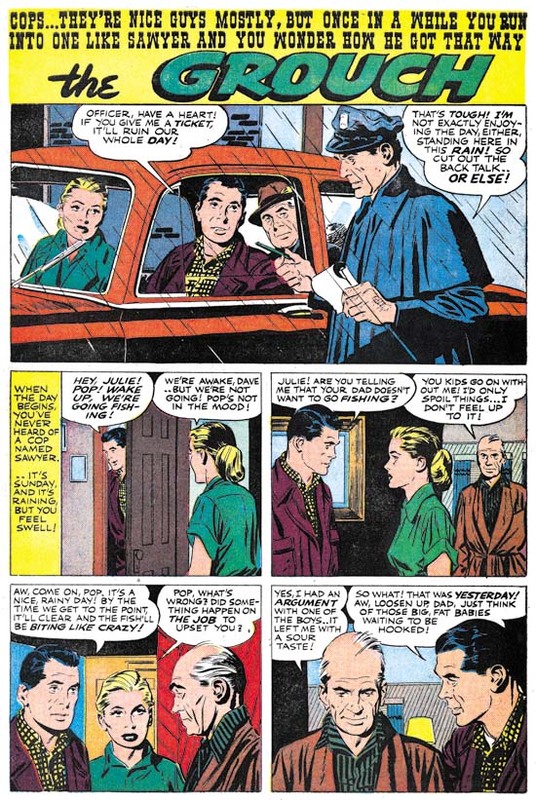 Simon and Kirby had a long history of the use of these wide splashes but there were only two created during the Mainline/Charlton period and this was the only one actually published on two pages (the other from Win A Prize #1 was rotated and printed on a single page, see the previous link). Since I have already posted on the splash page, here I include an image of page 5. 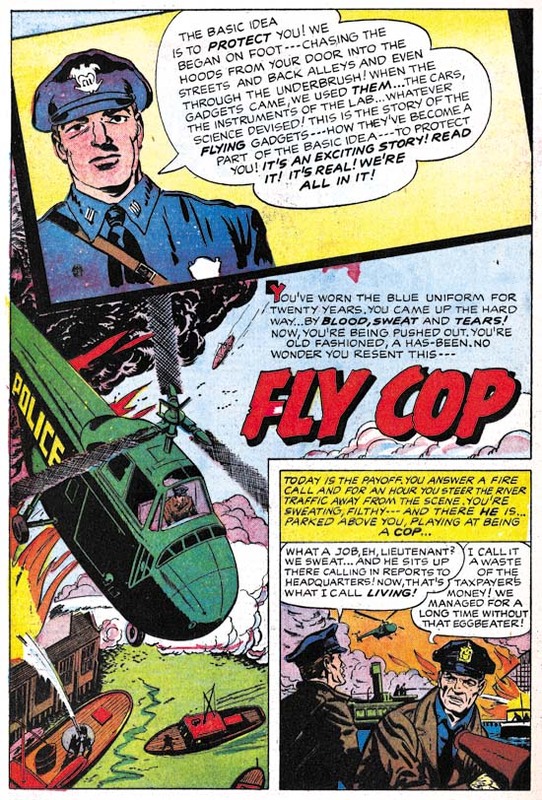 It serves as a reminder that while action was the key component of many Simon and Kirby productions, and Bullseye in particular, humor also played an important roll. The very physical humor found in the last three panels is very typical of Kirby. 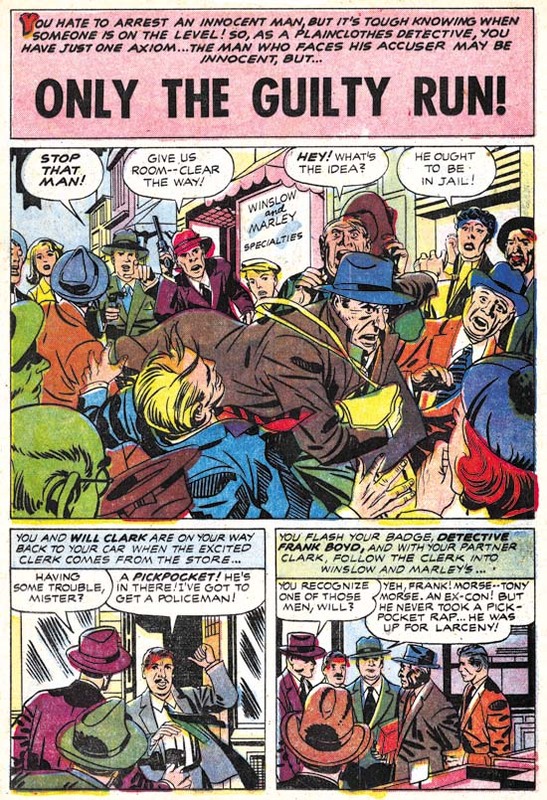 Bullseye #7 (August 1955) “Fightin’ Mad”, pencils by Jack Kirby, inks by Joe Simon? 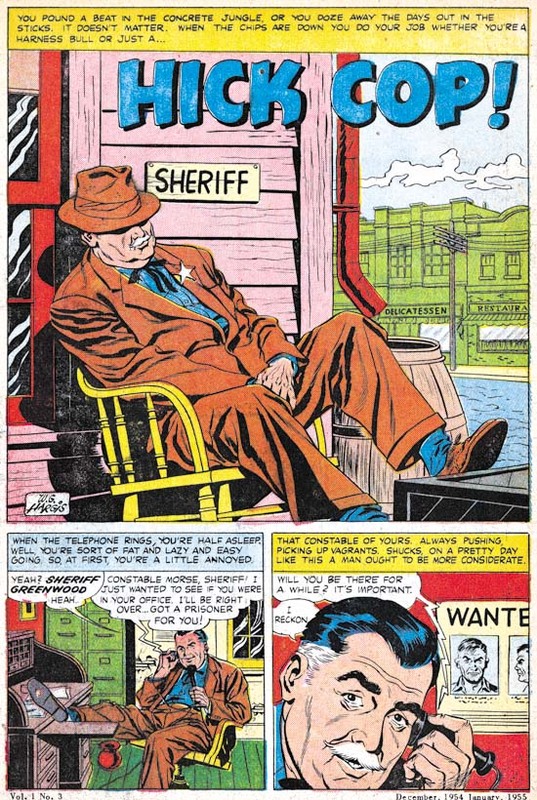 This issues ends with a Sheriff Shorty feature drawn by Kirby. This makes Bullseye #7 the only issue from that title entirely drawn by Jack. Normally this would make issue #7 a very special comic. The Sheriff Shorty story is special alright but for the wrong reason. It is a rare example of a clunker drawn by Kirby. The action scenes are uncharacteristically poorly executed and this cannot be blamed on the inker. Further the humor does not quite work. Hey everybody can have a bad day. 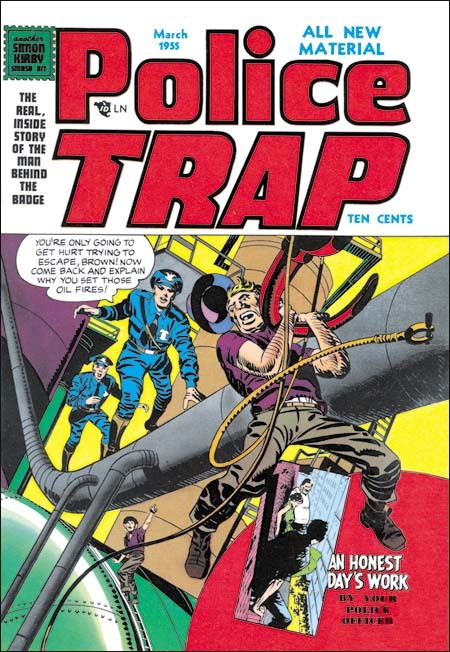 None of the Mainline titles lasted very long at Charlton, they were usually terminated after two issues (except for Foxhole which lasted for a third issue but that last issue appears to have been produced by Charlton without any involvement from Simon and Kirby). 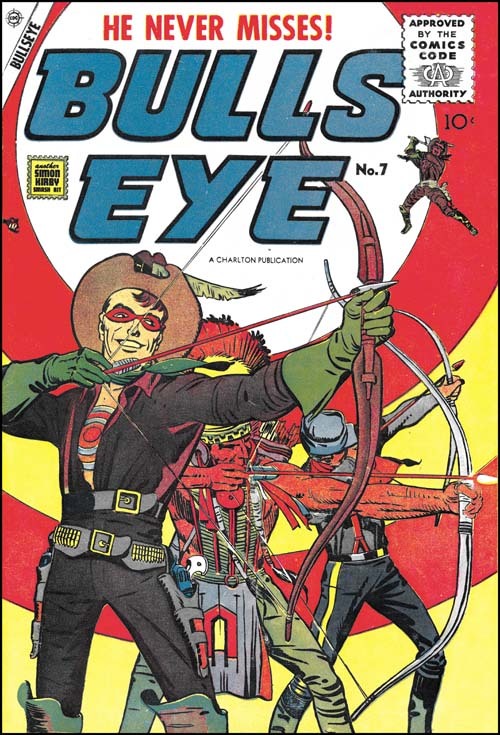 Bullseye was not an exception and issue #7 would be the last. In my opinion, all the Mainline titles were special but for Kirby fans Bullseye would be the most important. None of the other Mainline titles has anywhere near as much of Kirby drawn material. The only comic from this period that does was Fighting American. Which makes it especially unfortunate that Bullseye has never been reprinted. With the resurgence of interest in Kirby, hopefully that will change in the not too distant future. Posted October 17, 2010 in 2010/10, 6 Mainline, Artists, Bullseye, Kirby, Jack, Periods, z Archive. Just out of curiosity, did the Comics Code make S&K remove the Tomahawks from the hands of the fighters? They’re fairly obviously blocking and hitting with things that aren’t there. It’s especially evident in panel four of page seven. Look at the Indian’s hand and follow it to where an object, presumably a tomahawk would be hitting the ground as Bullseye rolls out of the way. See my hastily scribbled tomahawks below. Also, one would expect tomahawks on the splash page of a story called tomahawks for two and Bullseye’s upraised hand does look as if it might have been drawn. His tomahawks may be hastily scribbled but they made his point completely obvious. I have never seen the original art but I have absolutely no doubt that it would show white-out in those areas. 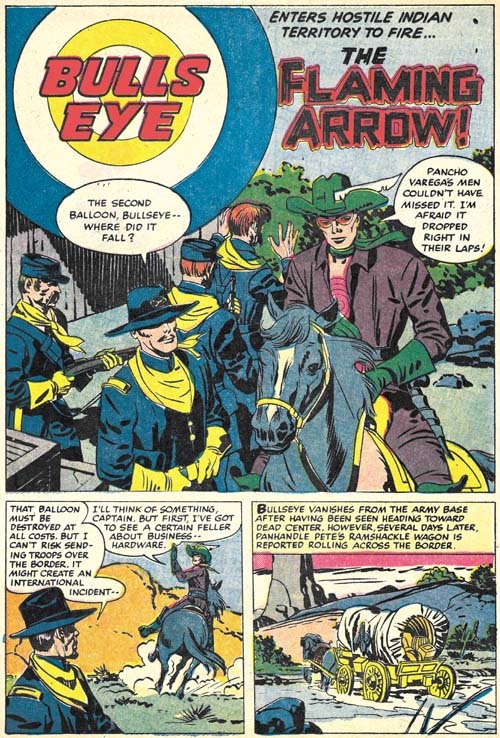 The Comic Code was recently introduced, for Bullseye first appearing on issue #5. Either “Tomahawks for Two” was drawn before the Code was enforced or Joe and Jack had felt that the fight scene was not too violent even with the tomahawks. After all children could see that sort of thing on television at the time. But the Comic Code was rather excessive when it came to the use of weapons so the tomahawks had to go. Nice work and thanks Charles. Among other things, Simon and Kirby are today celebrated for all the successful creations. 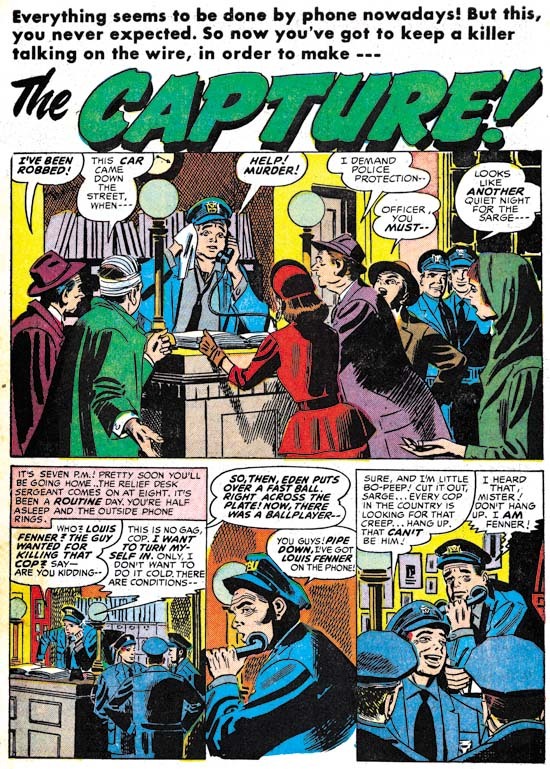 Most comic book artists were fortunate if they had one popular creation while Simon and Kirby multiple successes (Captain America, the Newsboy Legion, the Boy Commandos and the romance genre are perhaps their most significant). But not every Simon and Kirby creation received favorable recognition. 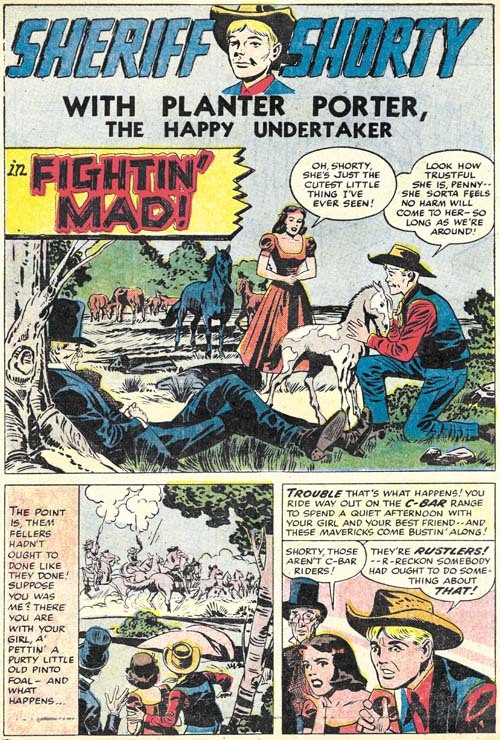 While today many consider Boys’ Ranch as Joe and Jack’s finest creation, in its day it just did not sell well enough to avoid an early cancellation. 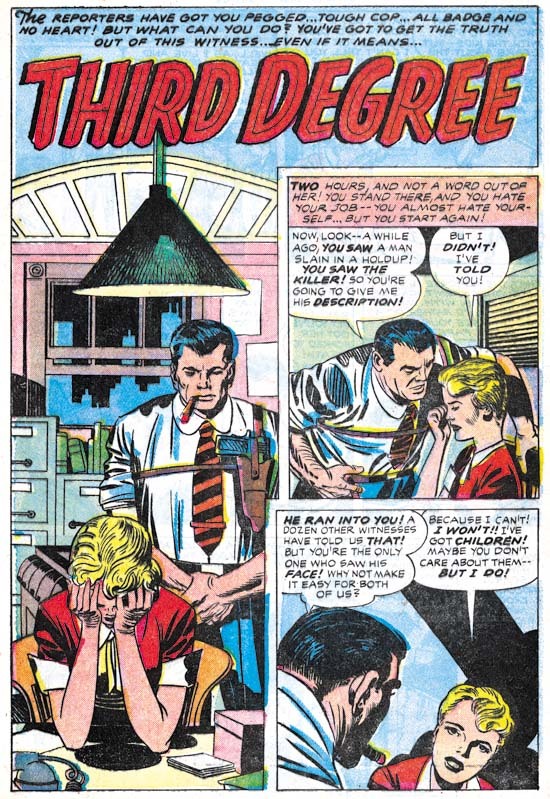 It is unclear how successful Mainline, the Simon and Kirby owned publishing company, would have been with Bullseye or any of their titles as Joe and Jack were doubly unfortunate in their timing. One problem was that under the pressure of public criticism the entire comic book industry had started to crash. The other difficulty was the economic difficulties that plagued Mainline’s distributor, Leader News. The second problem was not unrelated to the first as Leader News depended greatly on the revenues from EC, a comic publisher particularly attached by critics. When Leader News folded so did Mainline. 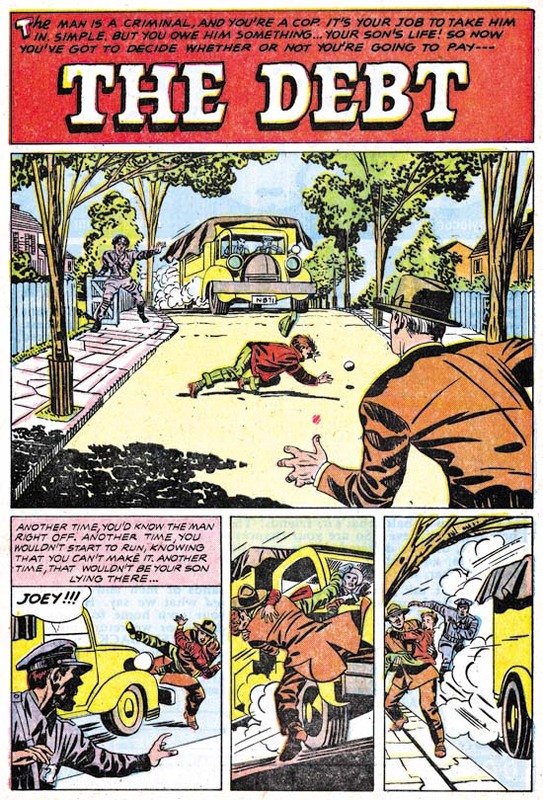 Simon and Kirby then turned to Charlton to publish the former Mainline titles. 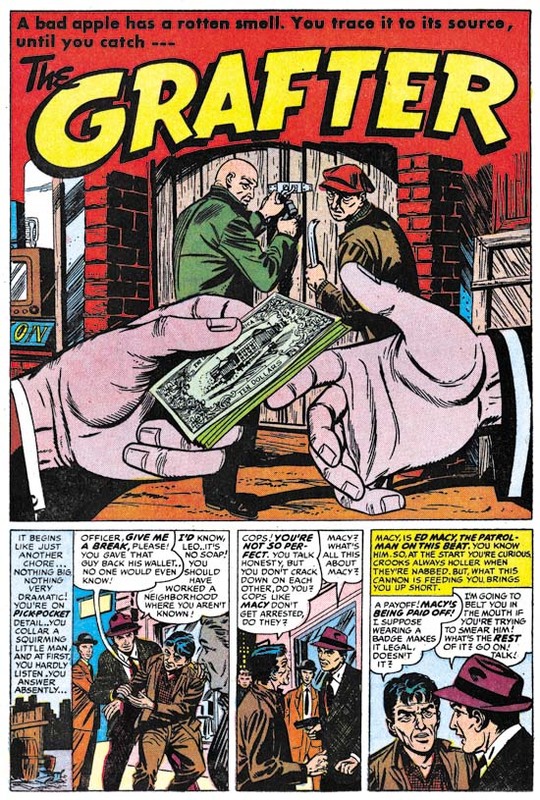 Joe has said that Charlton offered them the best deal but with the collapsing comic publishing industry there probably were not many alternatives. Because of the amount of time required to print and distribute a comic book, the art for Bullseye #6 was probably already finished before Mainline had actually failed. 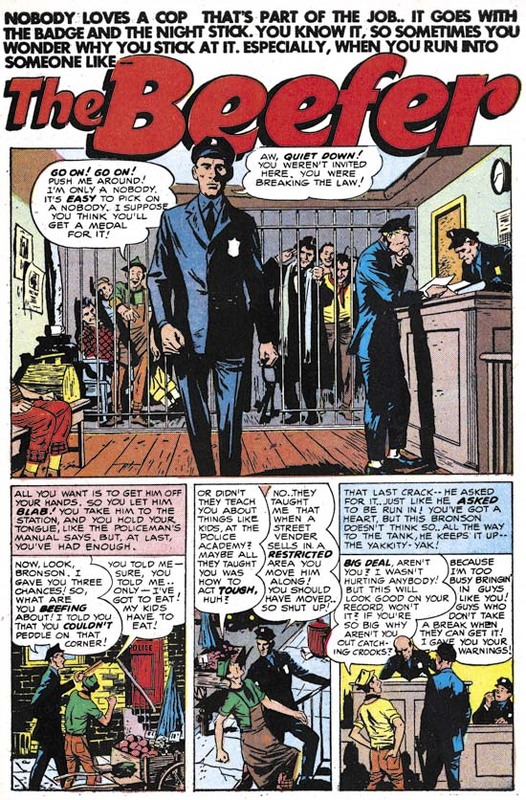 The fact that Bullseye #6 was released by Charlton on its normal scheduled time indicates that Simon and Kirby spent little time looking for a replacement publisher for their Mainline titles. The cover for issue #6 was the least successful of the Bullseye series. Unlike all the others issues, the bulls-eye pattern plays a part in the design of the title but not the actual image. What is presented is little more than an illustration from the interior story. Only from the cartouche would the reader understand the significant of the two foreground figures. 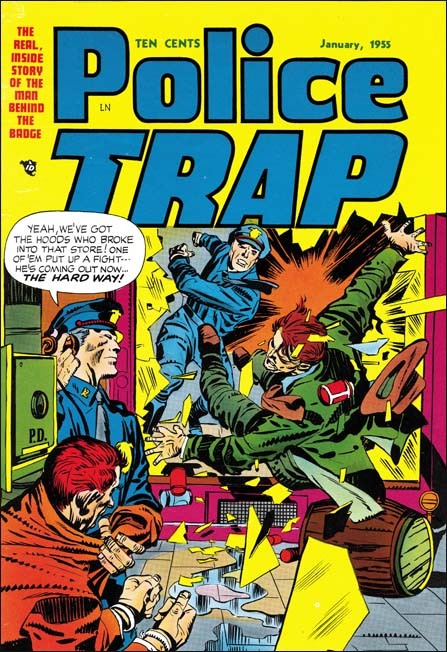 It does have the distinction of being one of the only two cover art of the Mainline/Charlton titles that bares a Simon and Kirby signature (Foxhole #5 was the other). 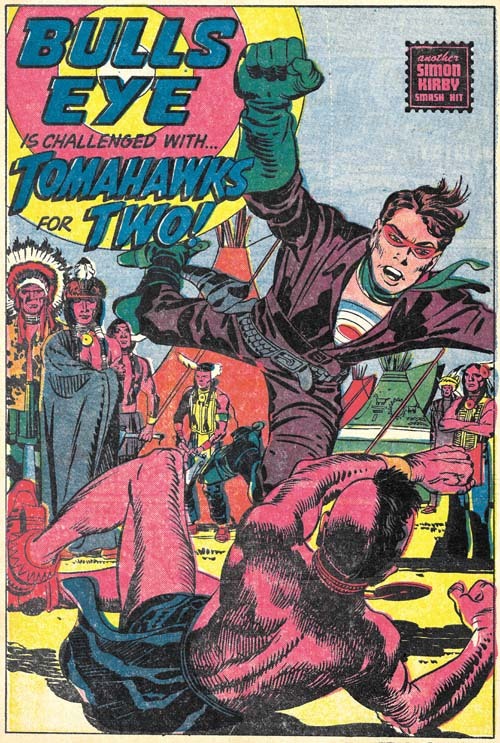 “Tomahawks for Two” is the start of the most ambitious story that Simon and Kirby did for Bullseye. With a total of twenty pages divided up into four sections, it is a much longer Bullseye story than any other. Actually it is longer than most Simon and Kirby stories created after the war. I use the term sections, because although they are essentially chapters, they are not actually called such. It is not just the length that is special, the story is probably the most unusual Bullseye tale as well. Two Indian brothers, twins actually, one of who is peaceful (called the Prophet) and another a warrior (named Scalp Hunter). Bullseye saves the Prophet but later ends up in a hand to hand combat with Scalp Taker. I could not resist including the fight scene. 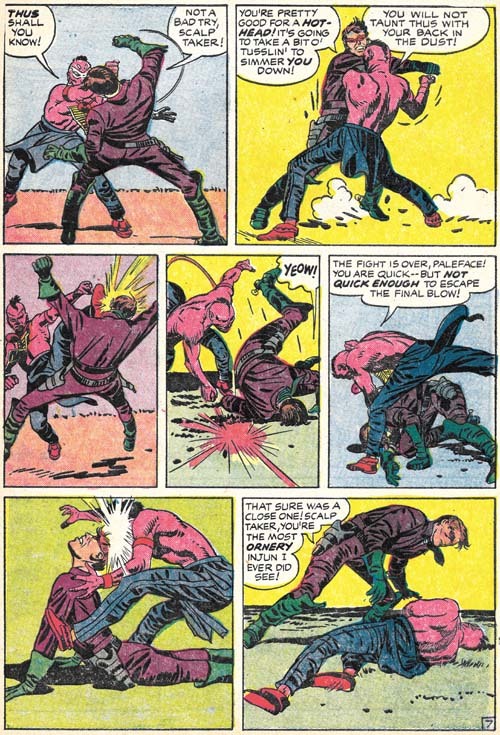 Kirby was unequaled when it came to choreographing such fights and this is one of his best. In this case he deviates from the 3 by 3 panel layout that he typically used for such battles. Although this is not a grid layout, there is enough symmetry that the reader’s attention is not drawn away from what really matters. As usually Jack has also minimized the background so as not to distract from the fight. 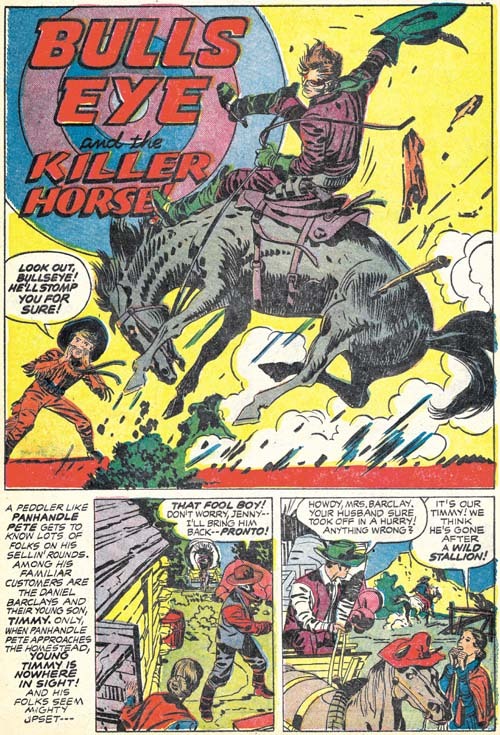 In an unusual and untypical manner, Simon and Kirby turn away from the tale of the two Indian brothers and now tell one about a boy and his love of a wild stallion. 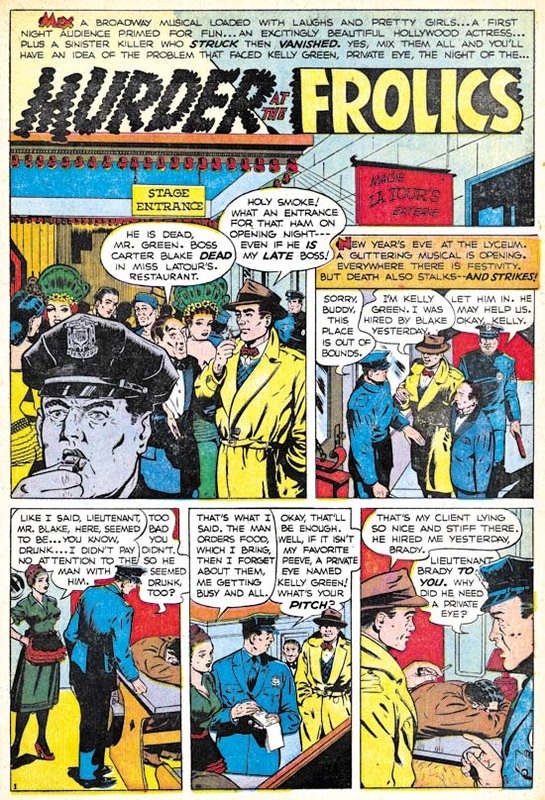 It is quite possible that this story was originally a stand-alone feature that was retrofitted into the Indian brothers story. 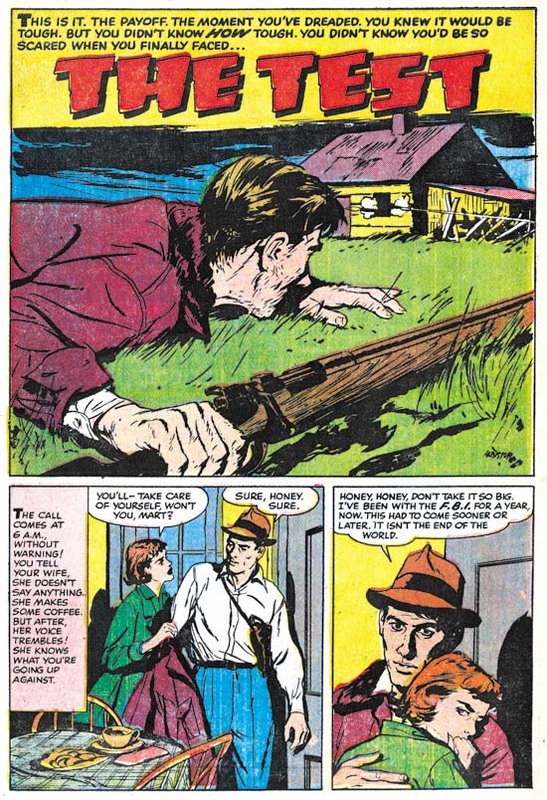 If so its last panel was reworked to include a distant Indian observer and a caption that ties the scout to the next chapter of the story. This story picks up with the scout seen in the last panel of the previous chapter. Next we see Bullseye and the family from the “Killer Horse” story being interrupted at their dinner. This is followed by plenty of action and a rousing battle between two Indian tribes. I really do not want to provide too many details for fear of spoiling it for those who have not read it yet. 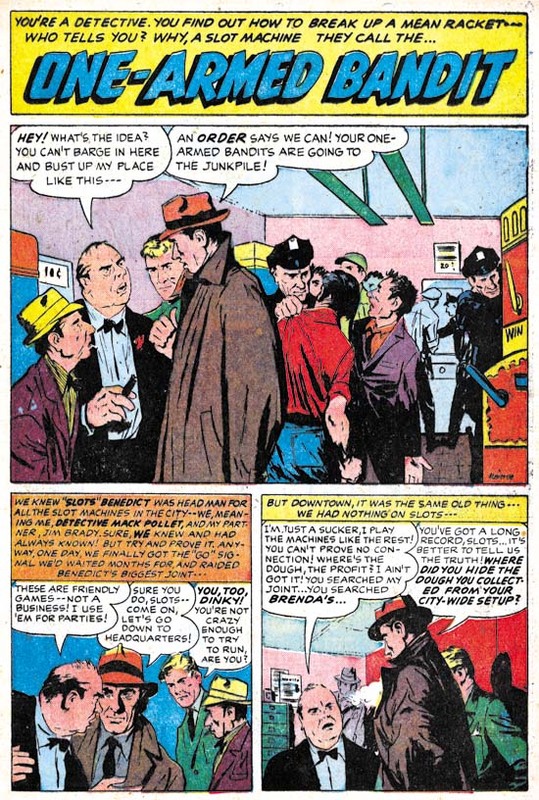 But it is perhaps the most complicated plot ever used by Simon and Kirby and it ends with the death of one of the two Indian brothers. 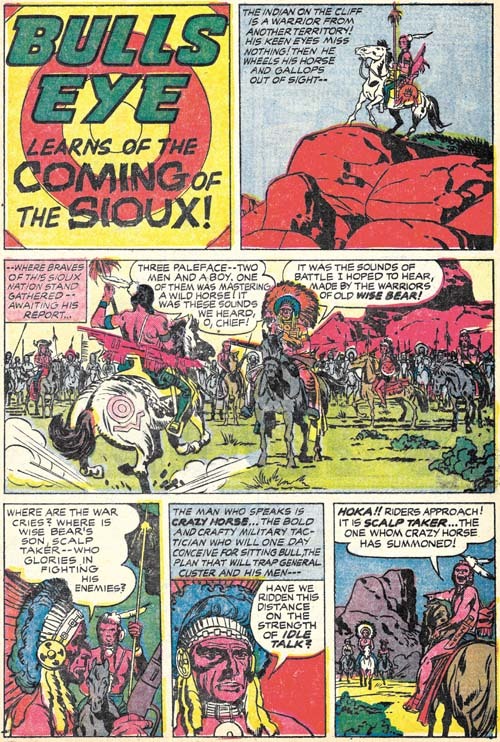 While “The Coming of the Sioux” has a true ending, Joe and Jack follow it with a short coda, “The Man Who Lived Twice”. This piece in a way mirrors the beginning of “Tomahawks for Two” that initiated the story arc. Here we find the fate of the surviving Indian brother. Again I do not want to go into any spoilers but this story arc is one of the best that Simon and Kirby ever presented. Kirby’s art is in really top form as well. 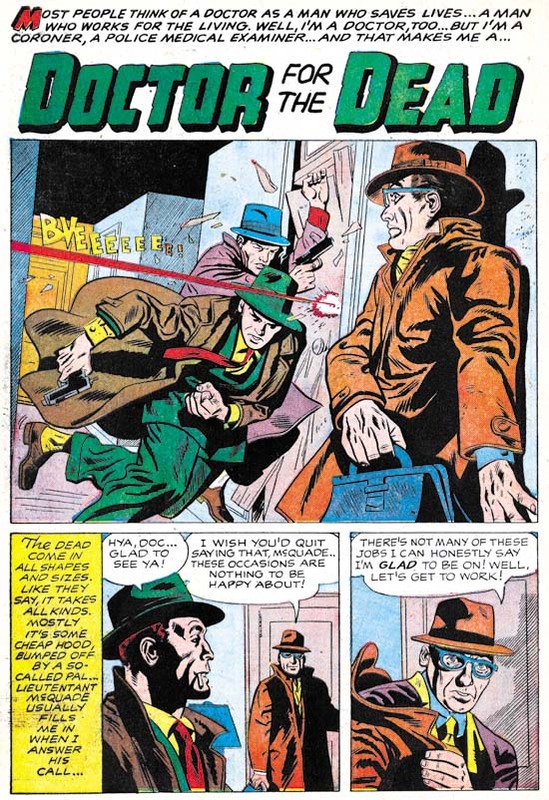 Bullseye #6 is a forgotten Simon and Kirby masterpiece. 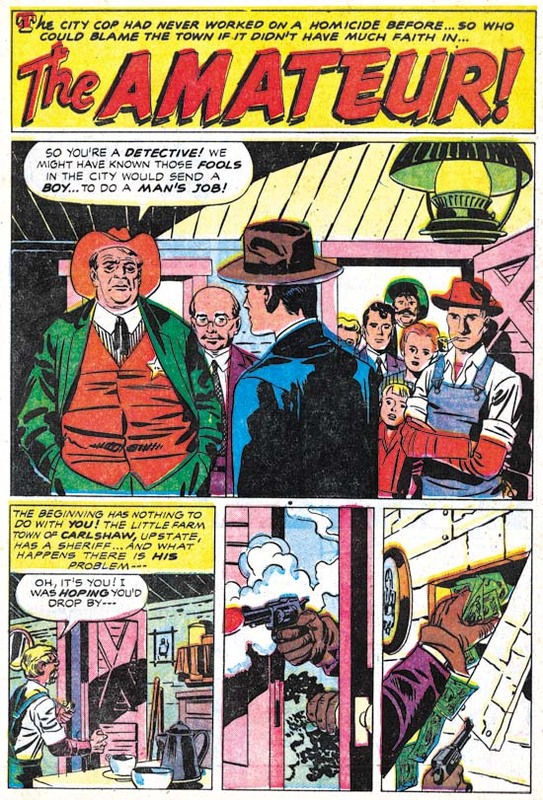 Bullseye #6 marks the return of Sheriff Shorty, a feature first introduced in Bullseye #3. 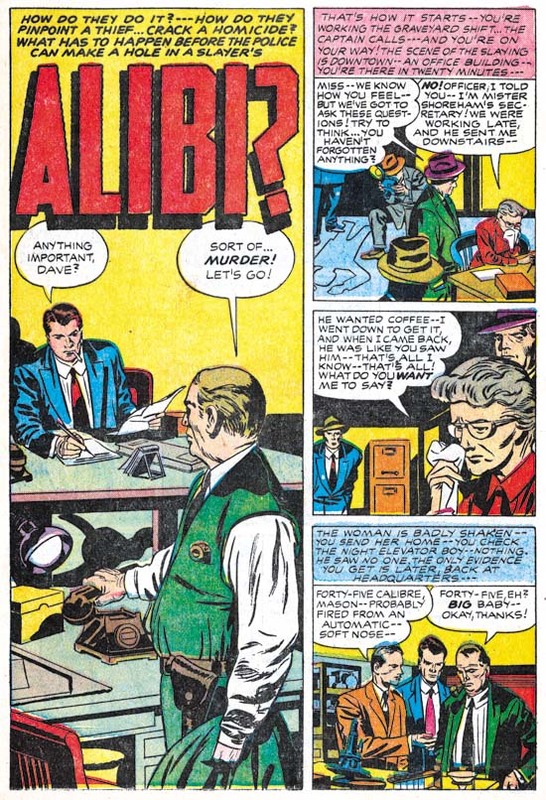 This time the artist was Al Gordon, whom I am not at all familiar with. 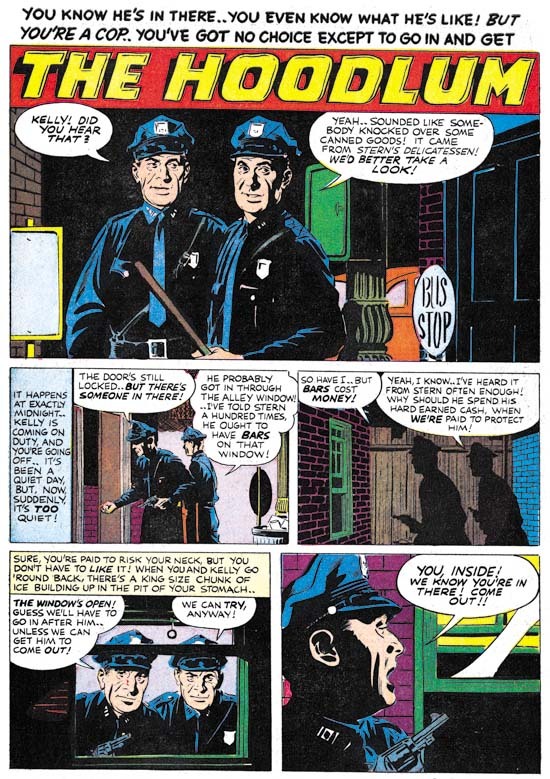 Gordon’s depiction of the characters follows those from Bullseye #3 so closely that some have attributed that story to Al as well. 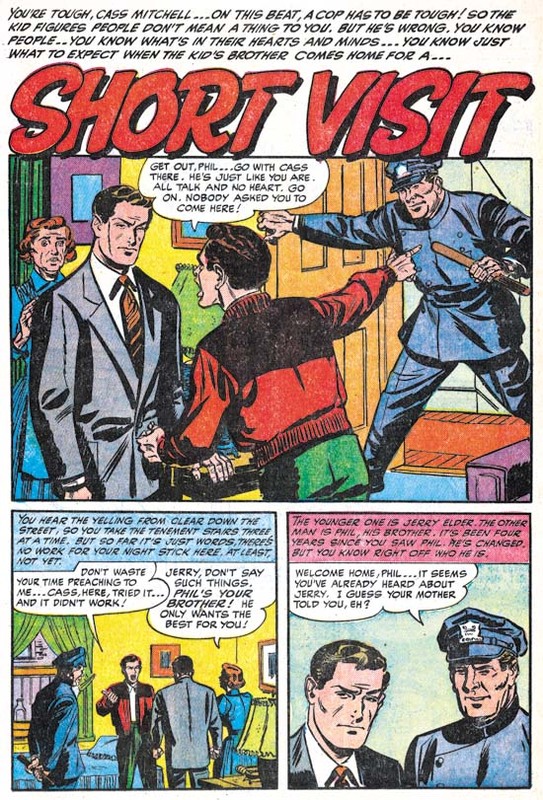 However as we have seen (Bullseye #3, Here’s Kirby) the origin story was drawn by Leonard Starr. 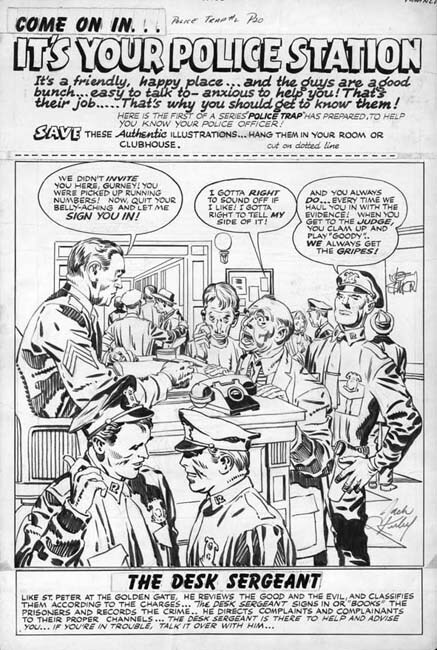 While Gordon is not as good an artist as Starr, he still does a respectable job on this short (four page) piece.